The North American Free Trade Agreement (NAFTA) has had a significant effect on Mexico's economy and institutions. The ongoing consideration of tax reform in Mexico requires an evaluation of the role of NAFTA in Mexico's economy, including its tax structure; it also requires an assessment of the impact of the Mexico's tax system on the trade and capital flows between Mexico and its NAFTA partners, the United States and Canada. Clearly, no good tax reform in Mexico can ignore the role of NAFTA. 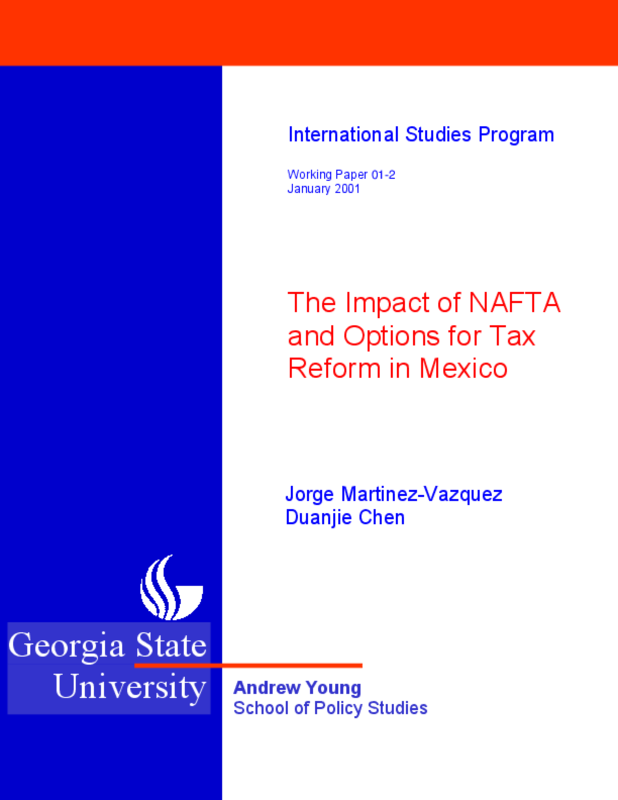 This paper provides a review of the evidence on the economic impact of NAFTA, focusing on the evolution of foreign trade and foreign direct investment (FDI) flows in Mexico, and how these changes have affected Mexico's tax structure in terms of its tax bases and the ability to raise tax revenues. Using the marginal effective tax rate analysis, it also compares Mexico's tax system with those of Canada and the U.S. in terms of the tax impact on FDI across the three countries. Two main findings can be drawn from this study. First, by fueling Mexico's export and FDI inflow, NAFTA has a profound impact on Mexico's economic structure and hence the industrial distribution of tax bases. This transformation, in turn, calls for the adaptation of the tax structure to a service and manufacturing-export oriented economy. And, second, there are no weighty reasons from a NAFTA perspective for Mexico to undertake fundamental changes in its tax structure. The new wave of tax reform should concentrate on the objectives of raising revenues, simplifying the tax structure, and increasing the efficiency and overall equity of the tax system. Working Paper Number 01-02.